In the following post, you will discover one more way to increase customer retention and sales. 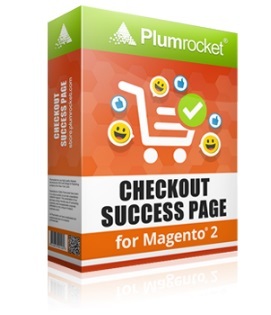 The fact is that we describe the Checkout Success Page Magento 2 extension by Plumrocket. This tool essentially improves the default success page, allowing you to add an extra layer of motivation focused on your clients. Easily turn first time buyers into returning customers or guests into registered store visitors. Below, we shed light on how to achieve these and other goals with the help of the Plumrocket Checkout Success Page Magento 2 module. 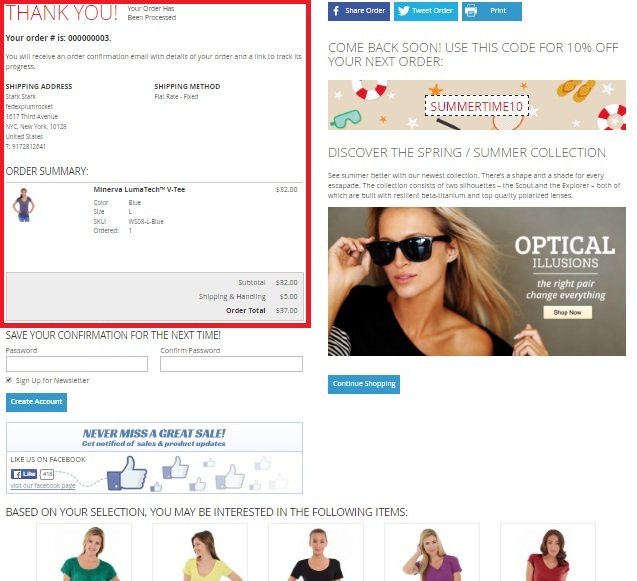 First of all, the extension provides the ability to display a full order summary on the checkout success page. 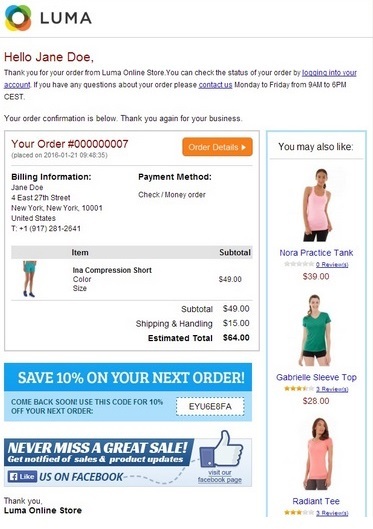 Add product pictures, order subtotal, and shipping details – such approach will make your buyers more loyal. And note that the ability to print full order summary details is available for both registered and unregistered customers. The next important aspect of the Plumrocket Checkout Success Page Magento 2 extension is related to registration. 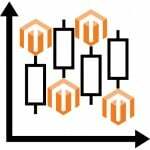 Chances are, you have a lot of unregistered buyers who don’t want to create an account on your Magento 2 website, because it is quite an obtrusive procedure. Luckily, there is a way to provide them with a new way to do so. Right on the “Thank You” page, the module adds a registration section that only requires to enter a password as well as confirm it. As a result, buyers get easy access to various data including order details and tracking information. Newsletter subscription is also among key features of the Checkout Success Page Magento 2 module. 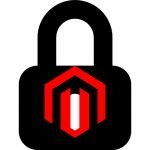 Both guests and registered customers can subscribe for deals, promotions, latest updates, and news before leaving your Magento 2 storefront. Precise Product recommendations are not a problem for Plumrocket’s module. 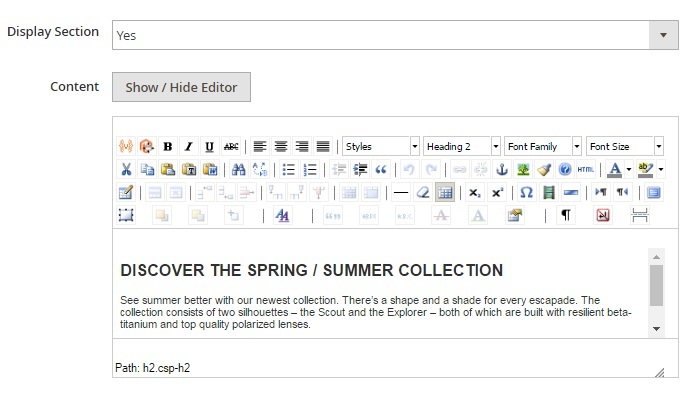 The extension allows to add a section with slider that displays up-sell, cross-sell, related, or recently viewed products. 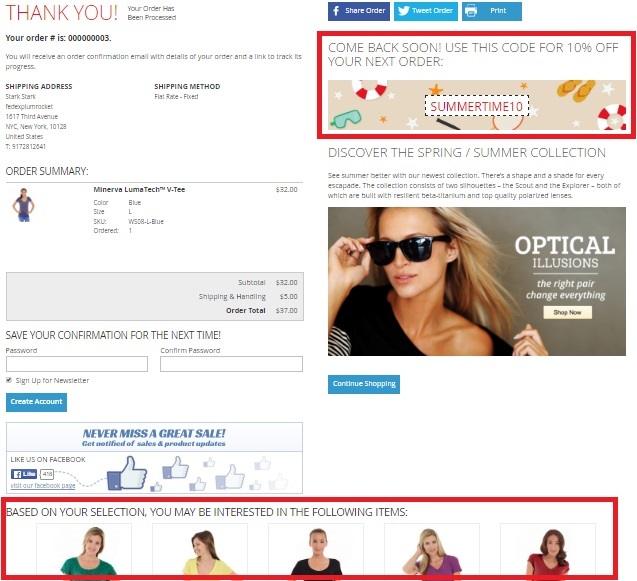 Personalized product recommendations are available on “Success Page” as well as in “Order Confirmation” email. 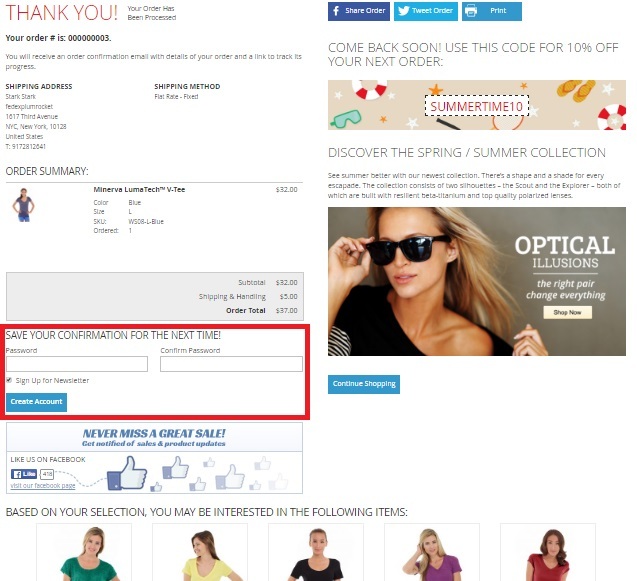 In addition, you can place custom or auto-generated coupon codes there. 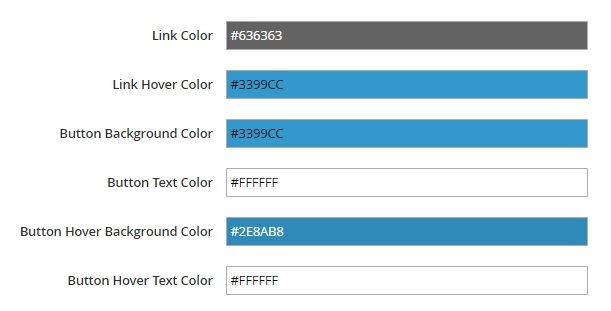 Note that it is possible to customize the appearance and promo message of discount codes as well as select a customer groups to display them to. 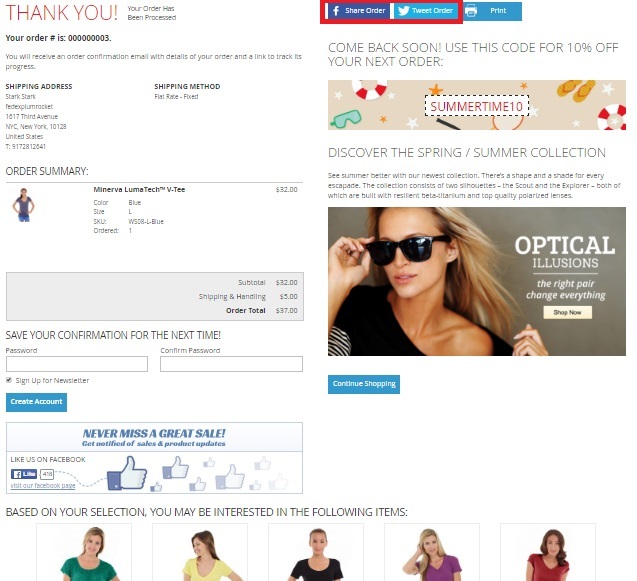 And due to social buttons, information about your ecommerce business will spread by word of mouth. Allow customers to share their shopping experience with friends and you will get more customers. There is even the Facebook Business Fan Page section on the success page that allows to promote your company’s Facebook page. 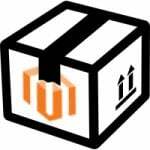 As for custom order confirmation emails, it is a little bonus you get by installing the Plumrocket Checkout Success Page Magento 2 module. The feature can be enabled from the Magento 2 admin where the extension allows to replace the basic transactional email template with a new one that includes the aforementioned features of the success page. Now, when you are familiar with the frontend appearance of the Plumrocket Checkout Success Page Magento 2 extension, let’s see how it works from the perspective of a backend administrator. 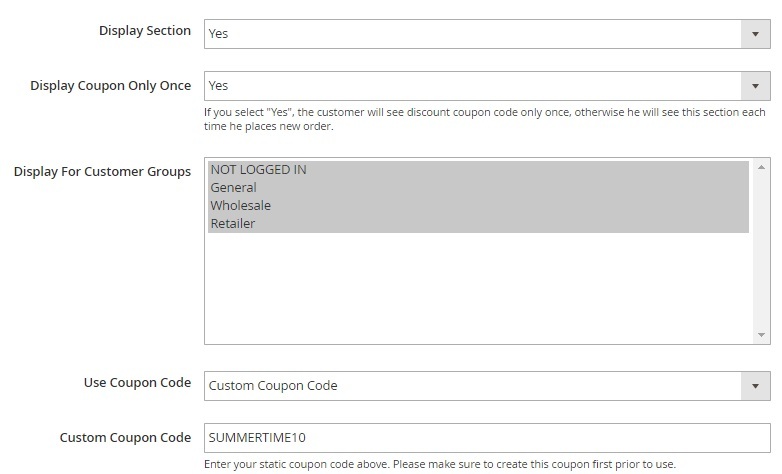 You can find 10 sections of settings under Stores -> Settings -> Configuration -> Plumrocket -> Checkout Success Page: General, Subscription Settings, Product Suggestion Section, Social Share Section, Discount Coupon Section, Right CMS Block Section, Bottom CMS Block Section, Facebook Page Section, Better Order Confirmation Email, and Design Section. Below, we describe each one. In the General section, you enable/disable the extension and provide your serial key. The Subscription Settings section allows to enable/disable the corresponding success page section. As for product suggestions, the Checkout Success Page Magento 2 module allows to show/hide the appropriate section, specify the number of displayed products, and select their type: up-sells, cross-sells, related, recently viewed. In Social Share Section, you can easily enable/disable its appearance on the frontend and add a message that will be posted on social networks after sharing. As for the coupon section, it has a more complex structure. As usual, you can show/hide it on the storefront. Next, there is an option that allows to decide whether to display coupons only once or provide customers with them every time they purchase something. Besides, the module allows to select customer groups and coupon code type (and enter a static coupon code for custom coupons). And there are two more options that allow you to create a discount coupon message and upload a background image for your coupon code. In Right CMS Block Section settings, you can show/hide the section as well as add its content. The same is about Bottom CMS Block Section. In Facebook Page Section, you decide whether to display it on frontend or not. If yes, specify your Facebook page URL. 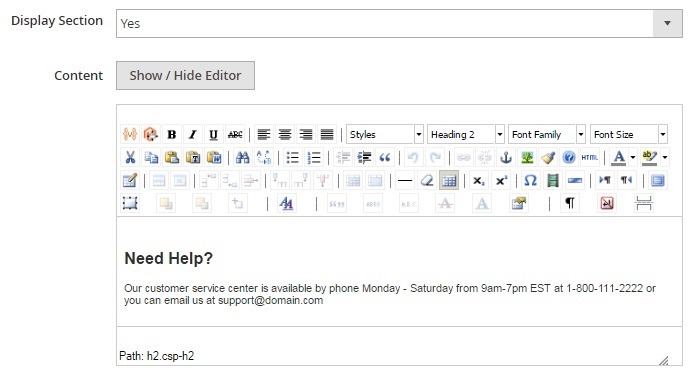 The Better Order Confirmation email section of settings provides the ability to enable/disable the feature, select a new email template, and choose suggested product type. Full order summary, shipping details, order subtotal, discount codes, and social media banners are displayed automatically.